to my eyes, her fall/winter 2008 collection owes even more to the designers of the wiener werkstatte. this may not be surprising, given poiret's inspirations. [In] May 1903, Koloman Moser and Josef Hoff- mann, with funds supplied by Fritz Waern- dorfer, Hoff- mann's patron, and the advice of Charles Rennie Mackin- tosh -- founded the Wiener Werkstätte (Vienna Workshops) for "the promotion of the economic interests of its members by training and educating them in handicraft, by the manufacture of craft objects of all sorts in accordance with artistic designs drawn up by Guild members, by the erection of workshops and by the sale of the goods produced." These artists wanted to institute a par- ticularly Viennese style and to produce ensembles in which all elements would reflect the same aesthetic principles. They looked back to the Biedermeier period of the early nineteenth century as the last great era of genuine Viennese design. The artists of the Wiener Werkstätte regarded the tradition of handcraftsmanship as basic. Machines were used, but the artist maintained complete control over what was produced. Wiener Werkstätte textile and fashion divisions were opened in 1910, and Paris couturier Paul Poiret was among the first to visit them. Critics of French decorative arts urged artists to learn from the effectiveness of the German and Austrian workshops in presenting designs in a single overarching national style. Ironically, French attitudes toward luxury and quality seemed to be part of the problem. French artists, instead of joining to form workshops to produce practical, well-designed objects for the middle class as in Germany and Austria, worked in isolation as fine artists making handcrafted individual pieces aimed at the aristocratic luxury market. French designers decided to band together to form the Société des Artistes Décorateurs in 1901. Artists in many media took part in its exhi- bitions. 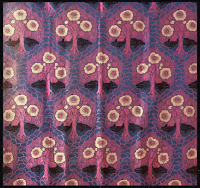 Jacques Doucet, Jeanne Paquin, Paul Poiret, Sonia Delaunay, and the American Mainbocher represented fashion over the years, while Émile Jacques Ruhlmann and Louis Süe, among many others, produced ideas for textiles because of their commitment to the decorative arts. This gave designers more visibility through annual exhibitions, but the French still could not agree on a central design philosophy. The debate raged throughout the first decade of the century. What style would be exclusively French and exclusively modern and could compete in the marketplace with industrial creations? Couturier Paul Poiret, who had been considering these issues even as he looked back to the Empire period for his influential straight loose gowns of 1907, was also acting to develop a new French style in textile design. By 1909, he had already visited Germany, where he showed his collections to great acclaim. There he purchased a group of German and Eastern European decorative arts, which he regarded as akin, in their "primitive" simplicity and vigor, to all of the various artistic expressions mani- fested by the Ballets Russes, founded by Serge Diaghilev with painter Léon Bakst and choreographer Michel Fokine and then the toast of Paris. 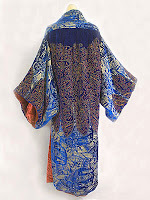 In Vienna, Poiret had been captivated by the Wiener Werkstätte with its cooperative spirit among architects (Josef Hoffmann), decorative artists (Dagobert Pêche, Koloman Moser), and painters (Gustav Klimt, whose companion, Emilie Flöge was herself a fashion designer with a salon in Vienna). meeting Hermann Muthesius, the Prussian architect and critic; designer Bruno Paul; and Gustav Klimt. He wandered the streets looking at new buildings and visited every recently completed interior to which he could gain admittance. I love Ana Sui ! it's so lovely ! thank you for the flower, princess, and i'm so glad to share this appreciation, papillon! 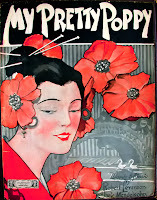 You've shown a few images recently of poppy flower on the side of the head kind of headbands. They remind me so much of Ozma of Oz. oh--i hadn't known about her before--thanks liza. she's lovely. they always remind me of mucha posters. You didn't know about Ozma?? I feel like I've given you a huge present. Go and immediately buy or borrow the book Ozma of Oz and you will be hooked. And then there are dozens more with her in them. There's a whole world of Oz and Oziana. I spent half of my childhood dreaming that I was living in Oz with Dorothy and Ozma. God, I love Anna Sui! The fragrances, the designs, everything! I never noticed those similarities before. Interesting comparisons! So interesting this post, about the French SEARCHING for their aesthetic. I was just reading about textile design in Victorian times, how the English were competing with the French and imitating their ever-changing fashionable items, specifically in the silk market. It was written something along the lines of that French children were brought up amongst good taste in fine art, walking in florals, gardens, etc. and so only naturally they could be great designers. LoL. In the end the English gave up on this due to high cost and specialized in their own plain woven fabric goods (although the machine/technology used were perhaps expert). I think it may be only to designers and patrons of art that the Germans and Austrians are known to have provided huge developments in art. Wiener Werkstatte. Bauhaus. WW for example is not even widely known. i'm so happy to see you here, giuseppe, making an interesting point, as usual. when i think of british textiles i think of liberty. and morris. and voysey. and arthur silver..... i also know liberty imported from japan. so ir's hard to understand about britian, unless you mean more about the manufacture, the fabric itself, and not the patterns? so interesting, the second part too, re the obscurity of the ww -- many years ago, i loved the music of caesera evora but she was really obscure. then one night i was over for dinner at these people's house and they were playing her. and everyone knew her. amazing inspiration and good observation. thank you so much, karen. glad you stopped by.